What are the 3 stages of frostbite (pictures)? What type of injuries can be caused by cold weather? What are the superficial and severe frostbite stages? What are the signs and symptoms of frostnip? What are the signs and symptoms of chilblains? What are the signs and symptoms of trench foot? When should you call a doctor if you have frostnip or frostbite? What is the first aid treatment for frostbite? How long does it take to recover from frostbite or frostnip? 9 Tips to prevent frostbite. First aid treatment for frostbite at home are call 911, cover yourself with blankets and move to a warm area, change any wet clothing to clothes that are dry. Keep the area that has been frostbitten elevated higher than your heart to get increase the blood flow to the heart, drink warm liquids, and don't rewarm the area because it leads to disasterous results. The appearance of frostbite may gradually change over time; the extent of the change depends on how severely the tissue is damaged. 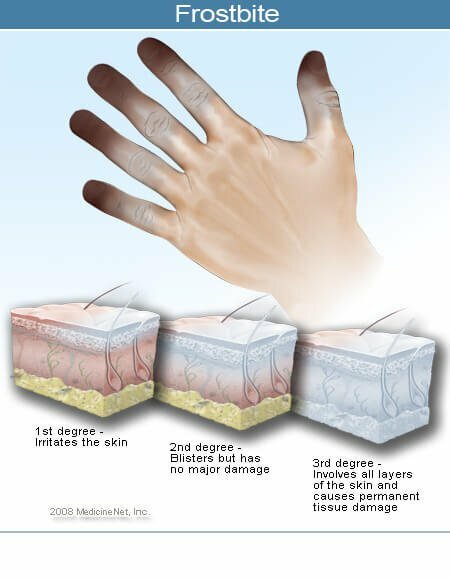 Figure 1 shows a hand with severe frostbite changes at the tips of the fingers and thumb (dark to black-appearing tissue) that gradually decreases in severity on the digits. The signs and symptoms of frostbite depend on the extent and depth of tissue injury. People with superficial frostbite may experience the following signs and symptoms to the affected area. The differences between frostnip and frostbite are the severity of the injury. Frostnip is an injury that occurs on the surface skin and doesn't affect the deeper layers of skin. . Frostbite is occurs when the body part frozen and then develops ice crystals within the cells, which ruptures them and causes cell death. Both frostnip and frostbite occurs on the surface of the skin like the cheek lips, ears, eyebrows, arms, hands, fingers, legs, and toes. Frostbite is a severe injury and requires emergency treatment. Call 911 or go to your nearest urgent care or Emergency department if you have frostbite. Winter cold and snow provide a number of opportunities to get outside and participate in activities such as skiing, sledding, and snowmobiling. However, without proper protection, cold weather-related injuries can occur even when temperatures are above freezing (32 F, 0 C). This is especially true if there are high winds or if clothing is wet. In general, however, it is both the temperature and the duration of exposure that play a role in determining the extent and severity of cold weather-related injuries. This information describes the different types of cold weather-related injuries, as well as what to do to prevent and treat them prior to reaching a healthcare professional. Cold weather-related injuries can be divided into two general categories. Hypothermia is a medical condition characterized by a core body temperature that is abnormally low. Frostbite occurs when there is freezing of body tissue, and it is the most serious of the cold weather-related injuries. Frostbite usually affects the hands, feet, nose, ears, and cheeks, though other areas of the body may also be affected. This type of injury results from decreased blood flow and heat delivery to body tissues resulting in damaging ice crystal formation, which ultimately leads to cell death. Upon rewarming of the affected tissue, vascular damage and complex cellular metabolic abnormalities lead to tissue death. Damage to tissue is most pronounced when there is prolonged cold weather exposure, the affected area slowly freezes, and the subsequent rewarming process is slow. Repeated thawing and refreezing of the affected tissue is particularly damaging, and should always be avoided. Frostbite injuries can be classified as either superficial or deep, depending on the tissue depth of injury. Superficial frostbite injuries involve the skin and subcutaneous tissues and Deep frostbite injuries extend beyond the subcutaneous tissues and involve the tendons, muscles, nerves, and even bone. Superficial frostbite injuries have a better prognosis than deep frostbite injuries. Frostnip is a mild cold weather-related injury that typically affects the face, cheeks, lips, ears, toes, and fingers. Symptoms of frostnip usually occur after exposure to cold weather. The area(s) may appear pale, be accompanied by burning, itching or pain, tingle, and feels numb. Simple rewarming restores normal color and sensation, and there is no subsequent permanent tissue damage. Chilblains (also known as pernio) are a common type of cold weather-related injury that can develop in predisposed individuals after exposure to nonfreezing temperatures and humid conditions. Chilblains typically develop because of an abnormal vascular response several hours after the area exposed to cold is re-warmed. Trench foot also referred to as immersion foot was named after the condition suffered by many soldiers in the trenches during World War I, though it is a condition still encountered today, often in homeless individuals. Trench foot develops after a prolonged exposure to a wet, cold, environment and is typically a more serious condition than chilblains. Tight-fitting, constricting boots and footwear serve to exacerbate the condition. Trench foot does not require freezing temperatures, and can occur with temperatures of up to 60 F (15.5 C). The symptoms of trench foot may include pain, itching, numbness, and swelling. The foot area may appear red or blotchy (red and pale areas mixed together) or even bluish-black with advanced injury. Blisters and open sores can develop. In severe trench foot, the tissue dies and sloughs off, and the development of gangrene can occur, sometimes requiring amputation of the area(s) where the frostbite occured. Chilblains can generally be treated at home, though if signs of infection develop from an open sore, individuals should consult a health-care professional. Patients with recurrent chilblains should also seek medical care, as there may be another underlying disease process leading to this condition. Frostnip can be managed at home, and this condition does not typically require further evaluation. Individuals with trench foot should generally consult a health-care professional to assess the degree of injury and to monitor for any signs of infection or gangrene. Individuals with frostbite or suspected frostbite should immediately go to an emergency room. Furthermore, these individuals may also be suffering from hypothermia, which requires additional treatment and evaluation, and may constitute a life-threatening condition. These are serious cold weather-related injuries that may require admission to a hospital. Generally, frost bite is a self-diagnosable condition so no imaging or lab tests need to be ordered. Frostbite usually goes away within a few days to weeks unless there are complications, like amputation of the body part affected. The initial treatment for any cold weather-related injury involves removing yourself or others from the precipitating cold environment, if possible, to prevent further heat loss. Move indoors, and remove all wet clothing and constricting clothing (such as socks, boots, and gloves), and replace with dry clothing. Avoid massaging or rubbing the affected area, as this will only aggravate the injury. It is important to note that some of these individuals may also be suffering from hypothermia, a potentially life-threatening condition. Gradually rewarm the affected area, and treatment can generally be accomplished at home. Some individuals may benefit from various lotions, while others may require treatment with corticosteroid creams. If open sores develop, they should remain clean and be monitored for signs of infection. Frostnip will generally improve with conservative rewarming measures at home. Frostnip to the hands, for example, can be treated by breathing into cupped hands or placing the hands in the armpit area. Alternatively, the affected area can be submerged in warm water until normal sensation is restored. Individuals with trench foot should have their wet shoes and socks removed, and the feet should be elevated, cleaned and air dried. Depending on the severity of the condition, some individuals may require antibiotics and/or surgical management of infection or wet gangrene (tissue destruction by bacterial infection, usually Clostridium spp). Frostbite requires immediate medical attention. Ideally, treatment should be instituted in a health-care facility, when possible. Prior to transport to a health-care facility, if possible, loosely wrap the affected area in a dry sterile bandage or a clean blanket to prevent further trauma. Cotton may be placed between the toes or fingers, if affected, to prevent any potential damaging effects of rubbing against one another. The most effective treatment measure for frostbite is rapid rewarming. This is accomplished by immersing the affected area into a circulating tub of warmed water that is between 40 to 42 C (104 to 108 F) for 20 to 40 minutes or until thawing is complete. Warm wet packs at the same temperature may be used if a tub is not available. It is important NOT to rapidly rewarm and thaw the affected area if there is a risk that it may refreeze. This leads to more severe tissue damage and must be avoided. During the rewarming process, the pain may be extreme and oral or intravenous analgesics may be required. After rapid rewarming is complete, the affected area should be dressed and splinted. Further treatment will focus on wound care, pain control, and providing a tetanus vaccine booster shot, if needed. Surgical consultation may be obtained for managing wound care, as well as for the longer-term sequelae of serious frostbite injuries that my require amputation of gangrenous tissue. The recovery time for a frostbite injury depends on the extent of tissue injury and whether or not there are any subsequent complications, such as infection. It may take 1 to 3 months before it is possible to determine the extent of tissue damage, and to clearly delineate which tissue is still viable. Some individuals will require debridement, skin grafting, or amputation of the affected area. Some patients will experience long-term sequelae from frostbite injuries, such as sensitivity to the cold with associated pain or burning, arthritis, increased sweating, and tingling of the affected area. Rarely, death occurs from infection-related complications. Anybody can develop a cold weather-related injury. The young and the elderly are more prone to these types of injuries due to vascular compromise or inability to effectively redistribute body heat. In addition, individuals who work outdoors, the homeless, and those who engage in outdoor activities are more likely to develop cold weather-related injuries due to their increased chance and time of exposure to the cold conditions. Alcohol and illicit drug use also make it more likely that individuals will develop a cold weather-related injury because these individuals have impaired judgment and they may not sense that they are in danger. Patients with certain medical conditions including psychiatric illness, circulatory problems, diabetes, dehydration, and smoking can develop a cold weather-related injury more quickly than other individuals. The prevention of cold weather-related injuries is best achieved through careful pre-planning and preparation for the cold, when possible. Travel with another person in case an emergency occurs. Take along an emergency kit and blankets in your car in case of a breakdown or accident. Dress warmly using multiple layers and adequately cover body areas prone to injury. Try to have an extra change of dry clothing so you can remove any wet clothing if necessary. Always keep your hands and feet dry and avoid wearing tight fitting clothing on these areas as it may decrease the circulation. Use waterproof shoes. Drink plenty of water and avoid alcohol, caffeinated drinks, and smoking. Carry high-calorie snacks to provide adequate nutrition. Most importantly, however, move indoors to a warmer environment when you begin to feel cold. REFERENCE: Cold Stress. CDC. Last reviewed: Jun 06, 2018.